Hydrangeas have large clusters of the flowers that bloom in the spring. They thrive in the sun with some afternoon shade and in soil that drains water well. Like any plant, hydrangeas can have problems. Aphids, mites, rust, mildew and rot are common issues with hydrangeas and if your bush looks as if it’s dying, it may be too late to save it. However, with quick action, you may be able to save your dying hydrangea and revive it back to full health. Water your hydrangea if it is wilting and the soil is dry. Keep it watered with about an inch of water per week, especially during hot, dry spells. Water your hydrangea less if the soil is soaking wet. Hydrangeas do not like wet feet and irreversible rot can occur if it is watered too much. If water puddles around your hydrangea due to poor water drainage, form a small (1 to 2 inch) mound at the base of the plant for the excess water to run off. Look for insects, such as mites, caterpillars, beetles and aphids, on the leaves. Wash the foliage with an insecticidal soap or spray an insecticide that is specific to the insect (for example, Sevin or Bt) on the leaves. Reapply as stated on the label, usually every 2 to 3 days and until the insects have disappeared completely. Observe the backside of the leaves for rust, which is evident by yellow to orange spots and is often accompanied with brittle leaves. If you see them, prune away the affected stems to the parent branch. 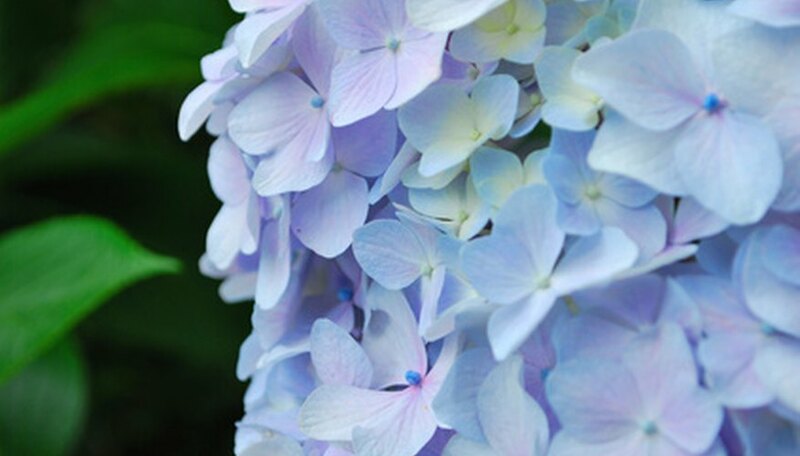 If too much of the hydrangea is affected (more than a third), then spray the leaves with a wettable sulfur (which is available at most garden centers) once a week until the rust goes away. Inspect the underside of the leaves for powdery white mildew. As with rust, spray the affected leaves with a wettable sulfur, but do so twice a week until the problem is eliminated. Also, add about 2 inches of mulch, such as bark or wood chips, under the canopy of the plant to prevent the rain from splashing on the underside of the leaves, which contributes to the mildew.